Rumination (recyclic negative thinking), is now recognised asimportant in the development, maintenance and relapse of recurrenceof depression. For instance, rumination has been found to elevate,perpetuate and exacerbate depressed mood, predict future episodesof depression, and delay recovery during cognitive therapy. Cognitive therapy is one of the most effective treatments fordepression. However, depressive relapse and recurrence followingcognitive therapy continue to be a significant problem. Anunderstanding of the psychological processes which contribute torelapse and recurrence may guide the development of more effectiveinterventions. 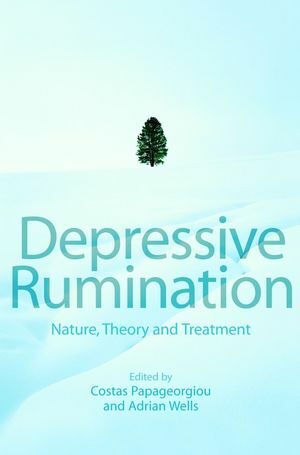 This is a major contribution to the study and treatment ofdepression which reviews a large body of research on rumination andcognitive processes, in depression and related disorders, with afocus on the implications of this knowledge for treatment andclinical management of these disorders. Costas Papageorgiou is Senior Lecturer at LancasterUniversity and was Deputy Director of the Specialist Service forAffective (Mood) Disorders in Manchester. He obtained a BSc fromthe University of Buckingham and an MA and a Doctorate in ClinicalPsychology from the University of Liverpool. Dr. Papageorgiou hasexpertise in the assessment and treatment of depression. He hasbeen extensively involved in investigating rumination anddepression and has co-authored the first empirical studiesexamining the link between rumination, depression, andmetacognition. Adrian Wells is Reader in Clinical Psychology at theUniversity of Manchester and Professor at the Norwegian Universityof Science and Technology, Trondheim. He is recognized for hiscontribution to the development of cognitive theory and therapy ofemotional disorders. He has published widely in peer-reviewjournals and has authored/co-authored several ground-breaking booksin the field. PART I: NATURE AND CONSEQUENCES OF RUMINATION. 1. Nature, Functions, and Beliefs about Depressive Rumination(Costas Papageorgiou and Adrian Wells). 2. The Consequences of Dysphoric Rumination (Sonja Lyubomirskyand Chris Tkach). 3. Reactive Rumination: Outcomes, Mechanisms, and DevelopmentalAntecedents (Jelena Spasojevic, Lauren B. Alloy, Lyn Y. Abramson,Donal MacCoon, and Matthew S. Robinson). 4. Mental Control and Depressive Rumination (Richard M.Wenzlaff). 5. Physiological Aspects of Depressive Rumination (Greg J.Siegle and Julian F. Thayer). PART II: THEORIES OF RUMINATION. 6. The Response Styles Theory (Susan Nolen-Hoeksema). 7. Rumination, Depression, and Metacognition: The S-REF Model(Gerald Matthews and Adrian Wells). 8. Rumination as a Function of Goal Progress, Stop-Rules, andCerebral Lateralization (Leonard L. Martin, Ilan Shrira and HelenM. Startup). 9. A Comparison and Appraisal of Theories of Rumination (MelissaA. Brotman and Robert J. DeRubeis). PART III: MEASUREMENT AND TREATMENT OF RUMINATION. 10. Measurement of Depressive Rumination and AssociatedConstructs (Olivier Luminet). 11. Psychological Treatment of Rumination (ChristinePurdon). 12. Cognitive Therapy for Depressive Thinking (Dean McMillan andPeter Fisher). 13. Metacognitive Therapy for Depressive Rumination (AdrianWells and Costas Papageorgiou).